The Illusion of Trade Deficits Fifth Grader Discredits Keynesians! Amongst the tragic dimensions of the BP spill is the unfortunate statistic that of the tens of thousands of drilling operations that have been undertaken in the Gulf of Mexico, this accident represents only the second underwater leak. It bears repeating that BP is struggling with robots and the extreme conditions of metal-working nearly a mile below sea level almost entirely because regulations and policies have forced them to. Indeed, there seems to be a direct correlation between the difficulty of the drilling location and our willingness to let energy companies operate there. Did BP make mistakes? Without question. Is the market punishing BP and its shareholders? $100 billion dollars of lost market capitalization so far would seem to say that it is, and the punishment continues daily. Granted, this means little to a shrimp fisherman whose business is being wiped out. But BP has also displayed little public reticence to making such stakeholders whole. But the disconnect to climate change is the following: Existing regulations on drilling operations did not prevent the spill, nor are they likely to prevent a new one, as Michael Barone describes. And regardless of how the BP spill is resolved, none of that is going to affect our climate. Indeed, the very catch-all term itself, “climate change” (which nicely allows for both global warming and cooling) represents the height of liberal arrogance that humans can even make any meaningful difference to a planet’s climate. With the basic premise of “cap and trade” being to incentivize companies to reduce greenhouse gases, if the science behind greenhouse gases being a “cause” of global warming is now more in doubt than ever, wouldn’t any potential legislation resting on this premise be correspondingly dismissed? Not if the true push behind the legislation was simply to raise money for other federal spending. At so many opportunities, “oil companies” and “greed” seem to appear in the same sentence. But if “greed” supposedly makes an oil company manipulate the prices of its product, would not the same greed spur that same company to provide as many products as it could to monetize the world’s desire for more environmentally friendly products? Why would these greedy companies sit back and watch such a money-making opportunity be captured by someone else? BP, Exxon Mobile, or any of the large oil companies would have the resources to produce the transformational electric car, or solar panel, or perpetual motion machine, if it were really that easy to do so. Lastly, there is the inconvenient truth that supposedly “green” forms of energy are just not nearly as efficient and cost effective in delivering the goods as their hydocarbon counterparts, as Scott Johnston’s recent piece on renewables makes abundantly clear. If government really wants to play a role in assisting with innovation, it should stop pretending that Keynesian-style subsidies and redistributions actually work, and promote proven policies that reward human ingenuity and technological investment. Don’t mistake any of this for a being a defense of BP. Rather, it is a necessary if painful discussion of the risks associated with the rewards of capitalism, and of human advancement in general. If anything, people are perhaps being surprised by sheer quantity of gushing oil. Might that be an indicator of how much additional oil we might discover if we simply had the national willpower to apply all of our technological prowess to look for it? As the campaigns heat up for the November elections, it is clear that the Obama gang is taking what may be their only shot at delivering the “change” that they sold to the public in 2008. The public’s not buying it, but like sweeping healthcare reform, they may just get it anyway, even as the Democrats lose Katrina as a big-bullet talking point. 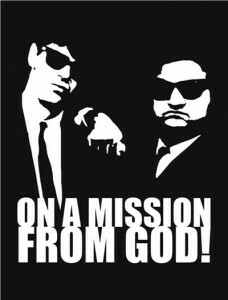 Where Jake and Elwood Blues were on a mission from God, it seems like Obama’s mission is more of the Kamikaze variety. What’s it going to take before you get it?